I seriously doubt that I'm the only baseball card blogger who has a litany of saved searches attached to their Ebay account. Names of obscure and long-since-irrelevant former Cubs max out my "following" section, in hopes of tracking down a new name for my Cubs All-Time Roster Collection. Oftentimes, I scroll through longingly, hoping to find a diamond in the rough, or even just something within my price range. I mean, many of the men I have left to search for played in the time of tobacco and gum cards and those aren't exactly junk wax material. Just the other day, something finally clicked and a name that I'd had on the "following" list for longer than I can remember showed a new listing, one that featured a card older than Topps baseball and yet was still cheaper than most modern retail packs. Let me tell you, I couldn't click "Buy It Now" fast enough on this beauty, lest someone sweep in and snipe me. $2.65 for this ultra-vintage oddball? Yes, yes, and more yes! Eureka Sportstamps were originally released in five, 40-stamp, uncut sheets way back in 1949. In total, the checklist contained 198 active players, including the biggest stars in the game, but only from the National League. The final two cards... erm... stamps in the set were dedicated to Commissioner Happy Chandler and NL President Ford Frick. Furthermore, there was an album available for the compilation of these 1.5" x 2" stamps. 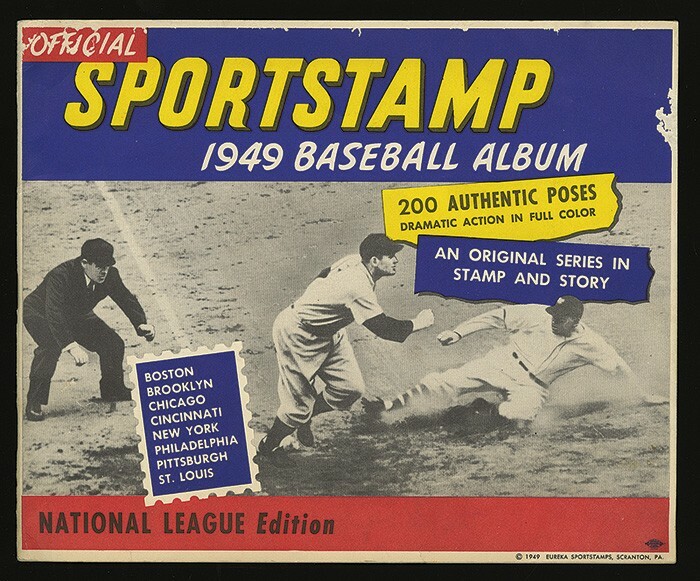 Although, calling this issue "Sportstamps" is almost misleading, seeing as the only sport included in the set was baseball - I guess "Baseball Stamps" lacked the appropriate alliteration? At any rate, this set is notable for a couple of reasons. To begin with, the set makes use of full-color, Kodachrome photography, something no other contemporary baseball cards were yet doing. Furthermore, they were actually printed up and designed by by a company known as National Poster Stamp Society, which marketed the sets through the "Poster Stamp Bulletin," making it just the second set marketed directly to the collector. 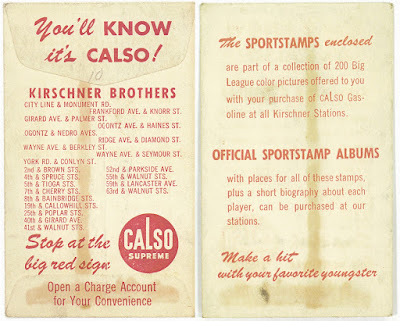 Yet, all of these things considered, you rarely ever hear of these oddballs - I guess in trying to appeal to both philatelists or baseball card-ists, they ended up appealing to none. By the way, at the time, the entire set of stamps and the corresponding binder cost a whopping total of $1 - nearly 3x what I paid for the single stamp above. Boy was I born in the wrong era. 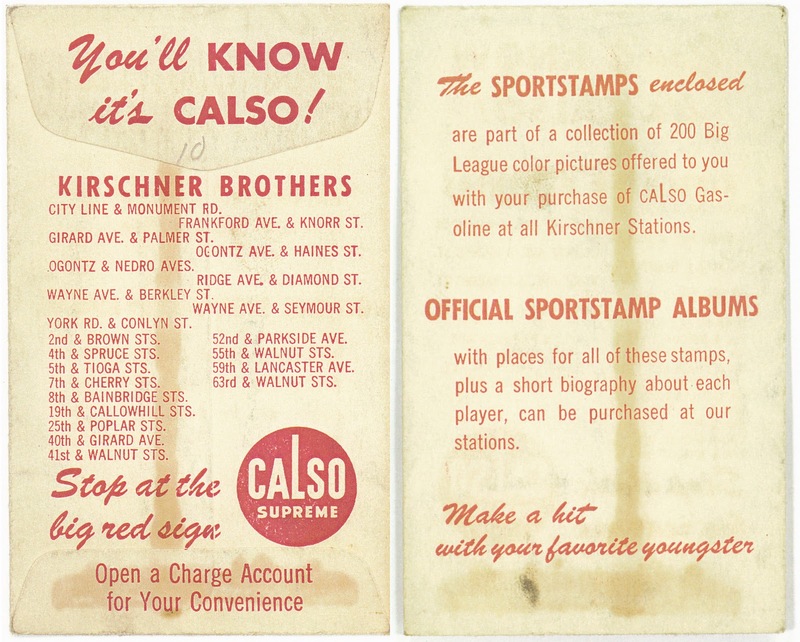 Furthermore, if you couldn't get your grubby hands on the "Poster Stamp Bulletin" back then, you could also visit one of the approximately two dozen Calso (a division of the ubiquitous Standard Oil Co.) gas stations operated by Kirschner Brothers in Philadelphia. Nowadays, I can find them on Ebay without having to even get in my automobile, let alone visit a gas station, or locate some off-beat trade periodical. So, maybe I was born in the right era, after all. Of course, while they featured the traditional "lick and stick" adhesive on their blank backs, these would not actually get your mail anywhere; they were for collecting and admiring only. Similarly, the only other baseball stamp I have in my Cubs collection is also another decoration piece, a George Burke stamp - featuring Roy Henshaw - from 14 years previous. They may not exactly be baseball cards, per se, but when your trying to collect obscure guys who only got to sip a cuppacoffee in the Bigs, you have to take what you can get. After all, this little stamp is the only "card" known to Beckett which features forgotten Cubs first baseman, Herman Reich. Herman Reich's name may not be remembered today, but his brief career is notable for one, strange quirk - during his single year in the Majors, he was swapped to three, different teams. Then, the one-year wonder was sent back to the bushes, never to be seen on an MLB diamond again. It was like everybody wanted him and then, suddenly, nobody wanted him. Reich's one year in the spotlight was, of course, 1949. The first baseman/corner outfielder began the season with the Cleveland Indians, after having been selected from the PCL Portland Beavers in the Rule 5 Draft - the longtime bush leaguer had been toiling in the minors since 1936. After making the team out of camp, Herm got into one game for Chief Wahoo's tribe, cranking out a hit and drawing a walk in 3 trips to the plate before being selected off of waivers by the Washington Senators. 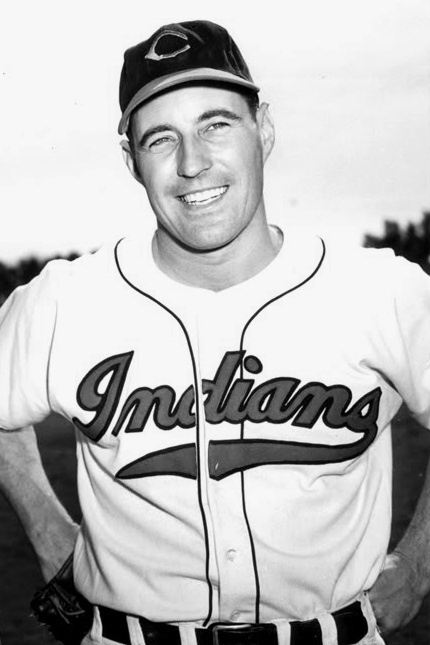 With the Sens, Reich made two pinch-hitting appearances (0-for-2) before being returned to the Indians, just ten days later. 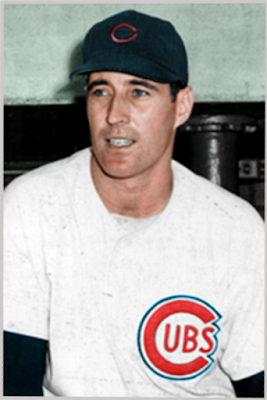 Then, the Cubbies came-a-calling in need of a first-sacker, as their longtime star, Phil Cavaretta, was nearing the end of his road. And so, he was again claimed off waivers and with his third team already in the young season, which had yet to reach mid-May. Someone caught Reich in an Indians uni - they were on the ball! In Chicago, Herman Reich managed to stick around for the rest of the campaign, getting into 108 games, mostly at first base but also spending time in right field. Of course, the Cubs of the late-40's (and throughout much of the next two decades) were the laughing stock of the National League and it was largely in this time period that their image as "lovable losers" was formed. As such, under the stewardship of disinterested owner PK Wrigley, many unassuming players who probably didn't belong in the Big Leagues nevertheless suited up for the once powerhouse franchise. Characterizing Herman as one of those dismal baseballers might be a bit harsh; however, he was definitely no star. During his time in the Second City, he posted a decent batting average of .280, but he didn't walk (.305 OBP) and possessed no power (3 HR and an anemic .360 SLG), despite manning a premium power position. That said, he must have played well enough to impress the crosstown rivals, as he was sold to the White Sox during the next off-season, though he'd never actually suit up for the Pale Hose. Though he was done with the Majors, Herman was far from done with baseball and returned to the PCL, where he would play for the better part of the next decade before hanging up his spikes for good after the 1957 season. Additionally, he also spent one year at the manager of the 1961 Idaho Falls Russets of the Pioneer League. I've seen sources which also state that Herman spent some time as a scout after his playing career concluded; however, I cannot verify with whom he might've have been employed. At any rate, that did it for time in pro ball. As you can see, it's rather fortunate for my CATRC binder that Herman had even the Eureka printed up in his name, as his Cubs career was both short and in-distinctive. 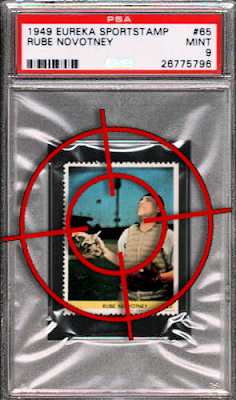 Although, with his expansive minor league career, it does seem quite possible that he appears in some uncatalogued, regional issue somewhere; but, I'll take this stamp and will do so enthusiastically. Post-baseball, Herman spent the rest of his adult life as, get this, an avocado rancher - how interesting is that? Fellow millennials - think of all the avocado toast he could have made! Besides growing "cheese pears" (as the Taiwanese call them), Reich also passed on his skills by coaching youth sports and his love of of our nation's pastime carried him to many Padres games (he was a California native, after all), old-timer reunions and storytelling sessions with old teammates and friends. Reich passed away, at the age of 91, in 2009. I think my wife and Herman would have gotten along just fine. Now, even with this find, I'm still not quite done with the Eureka set of stamps. You see, there's another Cub in this oddball set that has the Wrigley Roster Jenga cross-hairs set firmly upon it's sights - Rube Novotney. In this particular case, the "cuppacoffee" backup catcher, who (like Reich) only saw the Bigs in '49, does have a couple of other cards; however, those cards are a pair of rare, team-issued, minor league cards from his time with the L.A. Angels. These aren't exactly common releases and, for that matter, do not show Rube in his spiffy Cubs jersey. Therefore, the Eureka is the preferred ticket to my binder. I'm coming for you, Rube! As of now, the only listing found on "the Bay" is a graded copy which costs more than six times what his set-mate ran me (plus shipping). While this isn't an irrational price for a well-graded, off-kilter vintage piece, it's still more than my modest budget (or inherent cheapness) will allow for. 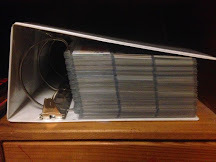 Plus, I just don't care for graded cards and I don't want to go through the trouble of breaking that flimsy, easily tear-able stamp out of it's casing. I suppose I'll just have to cross my fingers and wait. 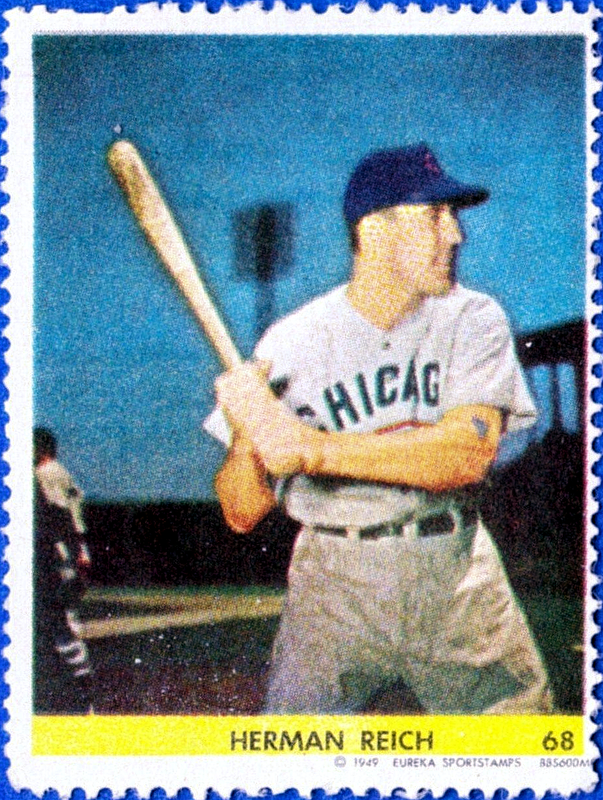 With that, I now welcome Herman Reich to my Cubs All-Time Roster collection; an inclusion made possible only by Eureka Sportstamps and a bargain-basement set break on Ebay. I'm supremely charmed that I wandered across that auction listing, as I do not think I should expect to run across sixty year old, regional oddballs (of an obscure player, no less) that cost less than the average McDonald's bill AND include free shipping. These are the the kind of deals that I dream about. You might even say that this transaction earned my "stamp" of approval. Congratulations on your find! 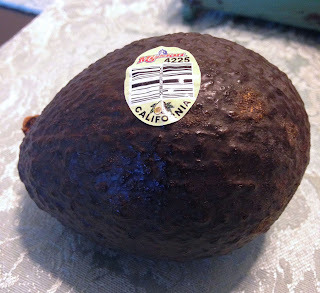 My wife is also an "alligator pear" fan. Sweet! I have a Marty Marion stamp from this set, expect they listed his name as Slats Marion. Congratulations on the find. love those oddballs which in this case, is made even more rare by the player selection! Nice!! Wow... a 40's oddball? Congratulations on this awesome pickup.